In 2017, the average saving of clients who changed to Indigo Square was 35% on their annual factoring bills. Contact us now for information on an easy switch service. We understand the equal levels of enthusiasm and trepidation with which people greet correspondence from Property Factors – Is this a bill for extensive works or correspondence to inform that requested improvements did not get sufficient fellow owner approval? Whatever the content of the dialogue the Indigo Square Management Promise that our service standards will be to deliver to You based on the simple ethos of our best endeavours to communicate quickly and transparently and deliver services, improvements and repairs promptly and at best value. Indigo Square Property Ltd was initially established as a letting agent, formed from the knowledge and experience of property professionals who owned, managed and let properties for over 30 years. When we set up Indigo Square we started with a blank piece of paper. We were not trying to mould and transform an existing business. The service standards of Indigo Square Lettings evolved from the simple thought process of “what do I want as a customer?” It is this attitude of focusing upon Your needs that has led to such rapid word of mouth growth in the Indigo Square Lettings business and it is this word of mouth recommendation that has led to the creation of Indigo Square Property Management and Factoring Division. 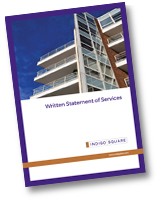 The first enquiries for Indigo Square to consider property factoring came from existing lettings clients impressed by our service standards and pricing strategy. Our strong customer focus that led to growth in our lettings division therefore now drives our Property Factoring business. The company is registered with the Scottish Property Factor Register (number PF000690). As a member of the Property Ombudsman (Member No. D13744) our service standards and complaints process is subject to external auditing and review. The most common reason people and properties remain with their factor is that they do not know or think it will be too challenging to change factors however it is usually a lot easier than people think. The requirements needed to change Factor are normally written into the Title Deeds of your property and if followed can will lead to a smooth transition between management agents. The management of Indigo Square are proud of the business we have developed and we would like to share our stories with you on developments that have already changed over to Indigo Square. If you would like to know more please call or email. One call and Indigo Square can do the rest.